We joined a CSA (Community Supported Agriculture) four summers ago and it was one of the best decisions we ever made. We belong to Bluebird Gardens out of Fergus Falls, MN. We bought a membership and every week we pick up an awesome box full of vegetables picked at the peak of perfection and full of healthy, straight-from-the-ground nutrients. Our farmer Mark and his crew are amazing! Each week he sends an awesome email describing the activities of the farm and what we'll find in our boxes. It's amazing to actually connect with the very people who produce your food and know all the love and care that they put into it. If you have the opportunity to buy into a CSA, do it! You won't regret it. The biggest head of romaine lettuce I've ever seen and a head of bok choy. 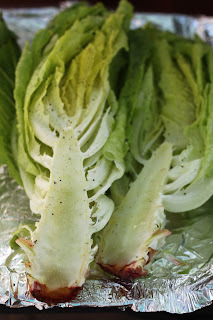 I didn't want to start out with just an ordinary lettuce salad so when I heard the idea of actually "grilling" lettuce, I was intrigued and put my grilling hubby to the test. I read a few different recipes and recommendations for how to actually grill the lettuce and settled on doing it this way. I took off the outer loose leaves and saved them for a plain old lettuce salad. I washed the lettuce under nice cold water inside and out the best I could. I dried it off well by rolling the head in clean towels.I cut the tight part of the head of lettuce in half through the stem. I rubbed the flat sides with olive oil and seasoned them with salt, pepper and a bit of garlic powder. Place the flat sides of the lettuce down on a hot, hot grill and just give it a minute or two to char. Flip the lettuce on all sides for a quick char and you're done! The grilling gives the lettuce a nice grilled flavor and brings out the sweetness in the lettuce. It was a fun way to prepare it and a beautiful way to present it if you want to get a WOW out of the crowd. Combine 2 cups of balsamic vinegar and four tablespoons of brown sugar in a small saucepan. Bring to a boil and let it rock until it has reduced by half and sticks to the back of a spoon. You're going for the consisistency of syrup. It will thicken up a bit once it has cooled so be careful not to overdo it or you'll have a sticky mess. 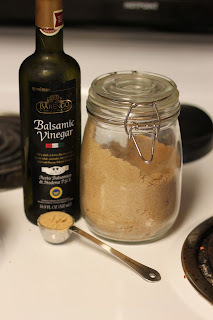 It can be stored at room temperature so put leftovers in an airtight container. Yields about 1 cup of glaze. 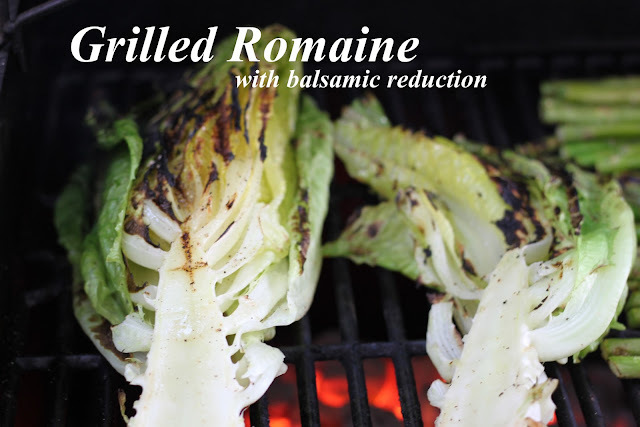 What did we serve with our grilled romaine? Steak of course! Awesome organic grass-fed ribeye steaks from Lynn Brekke's farm. (Yeah, we're those people.) Mmmm... some grilled peppers and onions and grilled asparagus. To grill the peppers and onions we just thinly slice the vegetables and toss in olive oil and season with S&P and cook on a lovely grill pan. Grilled asparagus... I think we eat it at least weekly in the summer. Trim off the hard bottoms of the asparagus and lay flat on a cookie sheet. Toss a little olive oil on them, sprinkle with coarse salt and pepper and squeeze a little lemon juice on them. Grill for just a few minutes on each side and squeeze a little more lemon juice on them before serving. Don't overdo the grilling. Asparagus tastes best when it's just a little softened and not mushy. Beautiful little babies. My hubby is a rockin' griller. Here it is! Grilled romaine with peppers and balsamic reduction. Not bad for week 1.